The US once was considered a champion of free trade and now is attacked by many as a protectionist nation. Some Republicans deeply oppose the trade and tariff policies that have been promulgated by President Trump, and others celebrate the effort as long overdue. The same split occurs in the Democratic party, as trade policy is one of those things that cuts across traditional political lines. 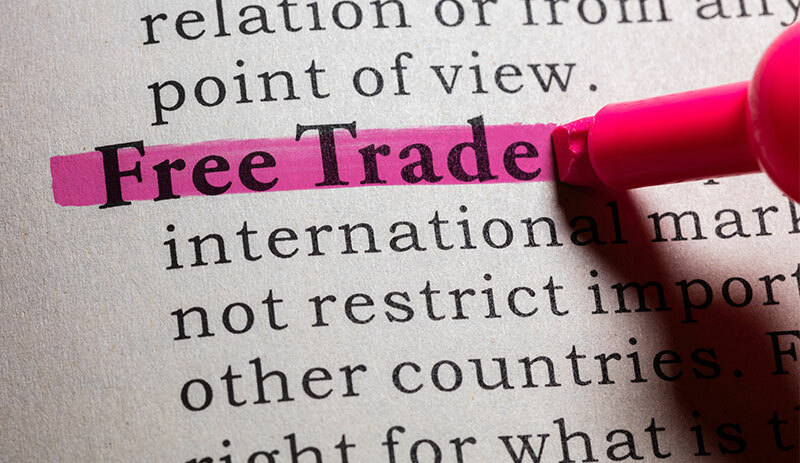 What exactly is meant by free trade or fair trade? Not surprisingly, dozens of answers exist, with few agreeing on even the basic idea. If one consults the textbooks, the issue of trade is neatly divided into two motivations, but this is rarely the way the real world handles it. There is trade based on “absolute advantage,” which takes place when a given nation is the only place where a certain product or commodity is found. The nation then can trade that unique product for other materials. The notion of “comparative advantage” is more complex and involves determining what a given nation does best. The US could produce bananas in Florida and Hawaii to free itself of the banana import tyranny, but it is not worth it. The US-grown fruit would be very, very expensive, so it is simply more logical to buy bananas from Honduras or Ecuador. By the same token, the Hondurans could devote a huge amount of their GDP to building the nation’s own commercial airliner, but it is simpler to trade bananas to the US and elsewhere and then use that money to buy planes. These simple constructs fall apart quickly. To begin with, no single nation has a true absolute advantage. Anything that can be manufactured can be produced anywhere there is a desire to do so. It is true that not every nation has gold or oil or rare earth minerals, but no nation has a lock on them either. It also is true that not every nation is capable of launching rockets to the moon, but there are several that can. The comparative theory would hold that developed nations would concentrate exclusively on the high-value and high-level outputs while leaving low-value production to others – as well as most of the food production – but that is not what happens. The impetus for most protectionism is a desire to insulate a segment of the population from competition. If a decision is made to import clothing from a nation that has far lower production costs, the average consumer will benefit from those lower prices, but the people who worked in the consumer’s country making clothes will lose their jobs. The political leaders have a natural desire to protect their constituents to some degree, although they have to balance that desire with the equally important desire to make their consumers/constituents happy. The push to protect becomes even stronger when the item has national importance – steel making, for example. To some degree, every nation is protectionist as it tries to make itself stronger, and there is inherent conflict when there is trade. People lose their jobs to a competitor that does a better job and attracts more consumers, but competition isn’t necessarily bad. Few would suggest having just one restaurant in town so that the cooks and waiters would have a protected job. For decades, it has been a goal of policy makers to bring order to the chaos of trade. This is why numerous sets of rules and regulations have been designed to “level the playing field.” Unfortunately, these can go only so far because countries are very different in terms of their assets. China can produce many products more cheaply than the US, simply because Chinese workers traditionally are not paid as much as Americans (or Europeans or Japanese, etc). The cost of living also is far lower in China and other similar nations. The issue comes when China does even more to give itself an advantage – giving subsidies to some sectors, stealing technology from rivals, banning imports that compete and so on. China certainly is not the only nation that does these things, which is why so many organizations dedicate themselves to halting the more blatant manipulations. To make matters that much more interesting, not all trade deals are about economic issues or trade. The US granted access to its market for years as part of its Cold War strategy against the USSR. A nation that agreed to support the US position against the Soviet Union would be granted access, regardless of what that might do to the US companies that competed with these imports. The end of the Cold War ended some of these deals, but other political motivations remain – fighting terrorism or taking a stand against some other unpopular regime. Today, the mantra is “America First,” and trade deals are anathema. Would that it was that simple. The question now is which “America” is first – the manufacturer/producer that is being protected from foreign competition or the US consumer who will be paying higher prices now that imports are restricted? The worker is pitted against the consumer, but the average person is both – and attention needs to be paid to both sides. All this is doubtless fascinating to one and all, but specifically what does this mean to those in the plastics business? As with most things, it is complex. The fact is the plastics business is one of the most globally centered. Consumers exist all over the world, and the materials that are used are globally traded. The price of oil and natural gas will have an immediate impact on revenue and profits, and these prices change daily according to global demand and global production decisions. The use of plastic is ubiquitous, finding its way into the very cheapest and the most expensive of products. It is exported and imported and only rarely are consumers even aware that it is a big part of what they just consumed. The top destinations for US plastics exports are Canada and Mexico – not surprisingly. These two countries account for more than half of what is exported from the US, which makes the creation of the US-Mexico-Canada Agreement important. In many respects, the revised pact is simply North American Free Trade Agreement (NAFTA) with a new name, but there have been changes in the domestic content provisions for the auto sector. It is useful to remember that “domestic,” in the context of the USMCA, means any of the three nations, but these new rules will make it much harder to bring parts and material from nations in Europe and Japan (among others). Past these big two, the US exports to China – third on the list and accounting for almost 5% of all exports (Canada is 8% and Mexico is 6.5%). The fact is that Chinese tariffs and restrictions on US exports will hurt. When it comes to imports, the Chinese dominate – the US imports almost three times the plastic it exports to China. Right behind the Chinese are the Canadians, and they export twice as much to the US as they import. China accounts for roughly 5% of all exports to the US, and Canada accounts for around 4%. This essentially means that the US exports and imports to/from hundreds of countries all around the world. It would be almost impossible to separate the pattern of plastics trade into “good” and “bad” – or even fair and unfair. The producers of specific plastics may be up against a heavily supported competitor from another nation or they may have carved out a niche that gives them what amounts to an absolute advantage. Trying to govern this through a maze of laws and regulations can be daunting, and many would assert that it is detrimental to try. On the other hand, the fact remains that many nations do their best to manipulate and alter the market to suit their purposes and thus distort the notion of real competition. The US once was perhaps too committed to absolute notions of free trade and too attuned to the needs and wants of the consumer – but now may have swung too far in the other direction towards protectionism that will detrimentally impact the bulk of American and global consumers. Chris Kuehl is managing director of Armada Corporate Intelligence. Founded by Keith Prather and Chris Kuehl in January 2001, Armada began as a competitive intelligence firm, grounded in the discipline of gathering, analyzing and disseminating intelligence. Today, Armada executives function as trusted strategic advisers to business executives, merging fundamental roots in corporate intelligence gathering, economic forecasting and strategy development. Armada focuses on the market forces bearing down on organizations.